I started after lunchtime at Pomezní boudy, where I got a bus ride from Trutnov. It’s not very often that bus can take you all the way to a trail start! I began slowly heading up on an asphalt road. Yup, asphalt road. 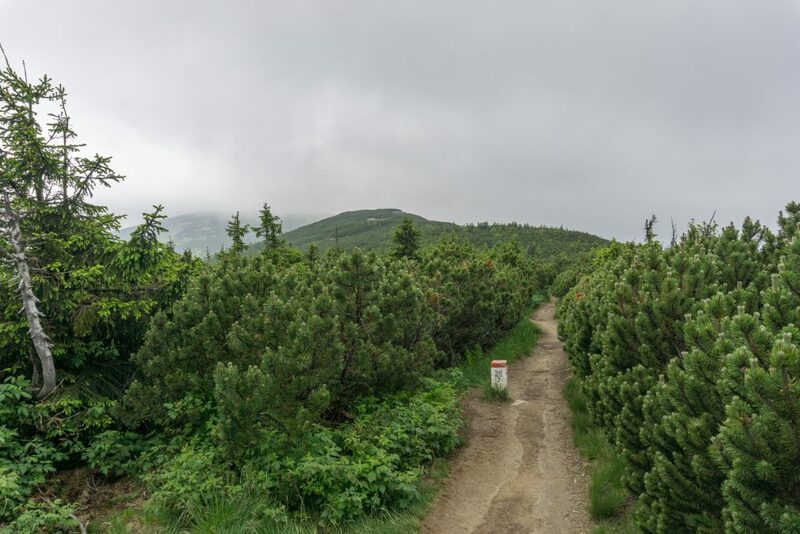 After a few kilometres the asphalt road had changed into a regular forest track which led me towards the base of Sněžka (1603m), the highest mountain of Czechia. The closer I was to the top, the more people I met. At one point it became quite funny to hear from people lined up in front of me questions like “Would you like to pass me my friend?”. I expected it to be crowded but this was a bit above my expectations. And it was a really foggy day! I can’t imagine what it must be like on sunny days. 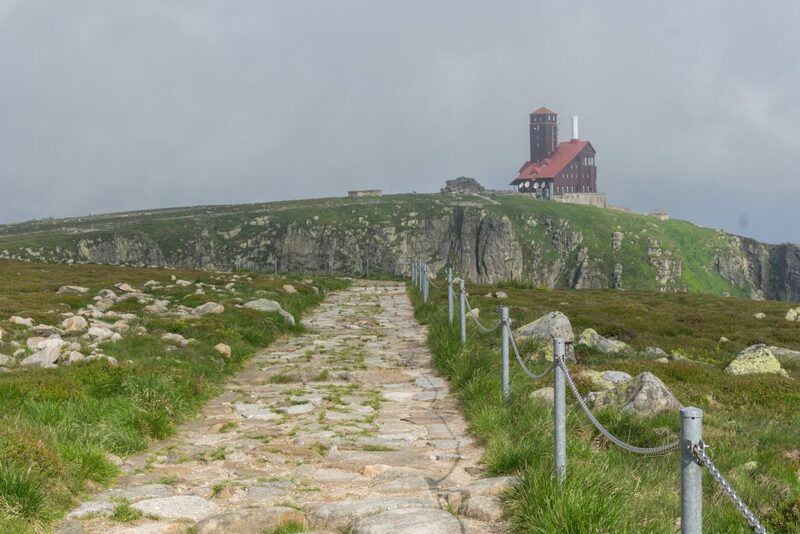 On the top there was a cute church, strong wind and a lot of fog so I rather began the descent towards a saddle called Obří sedlo. The path there was paved with steps and accompanied by handrails and chains. I know it’s for the protection of the mountain from human induced erosion but it just doesn’t feel like being in the mountains. I especially got that feeling after seeing empty beer cans along the path and people in flip-flops. That’s what it looks like once people “civilize” the mountains with cable cars and roads. From the hut Slezská bouda I decided to descend towards Dvorská bouda where I wanted to sleep that night. It’s a bit further away from the main ridge (about 5 kilometres south) but it was worth it to escape the fuss of the main ridge. Dvorská bouda turned out to be an old fashioned hut where the staff were friendly and smiling. They let me sleep in a bed in my sleeping bag for 200 CZK. 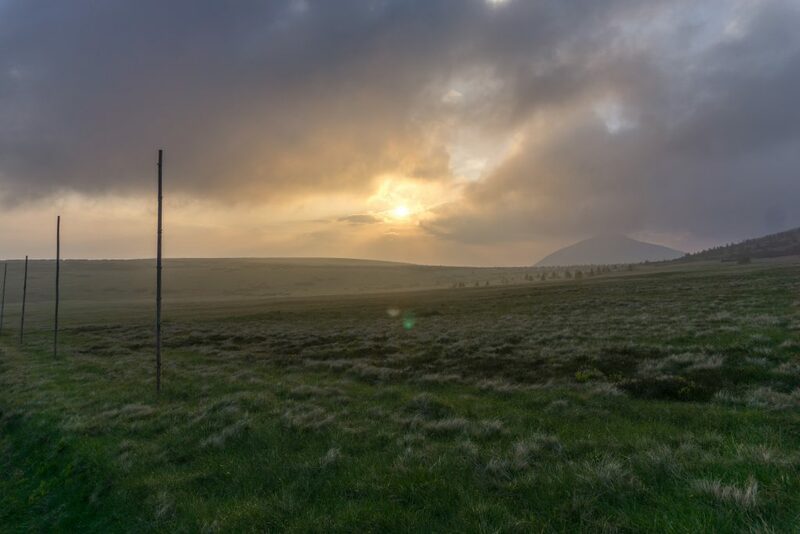 The following day I woke up before 4 AM and was back on the main ridge before 5 AM. There wasn’t anyone and I finally felt like I was in the mountains. I continued towards the western end of the trail, passing local tundra and beautiful rock formations. 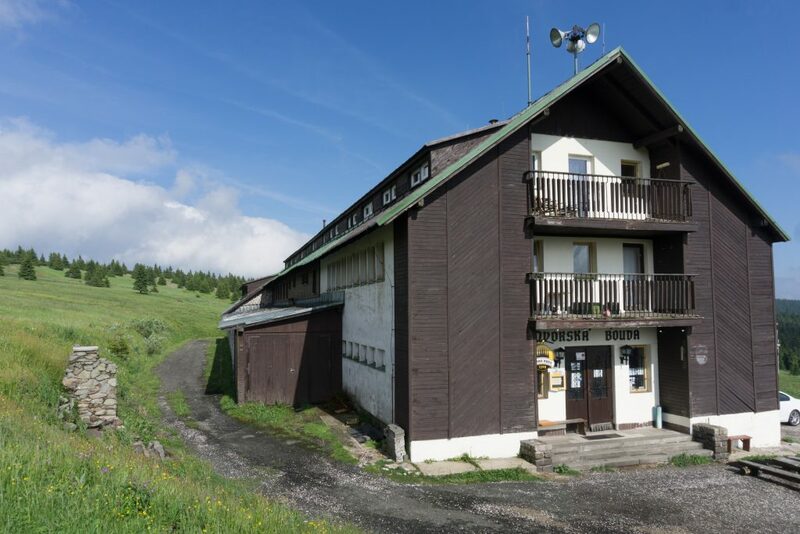 At the main ridge, at Špindlerova bouda, I learnt that there is a bus stop, huge parking place and all the necessary things like trampolines and scooter rentals. I started to wonder where the line is for all of this? We build hotels in the forest so we have a place to stay when we come to admire the forest. But what if the forest turns into so many hotels that there isn’t a single tree left? Hasn’t it actually happened before? Have we actually learnt from it? 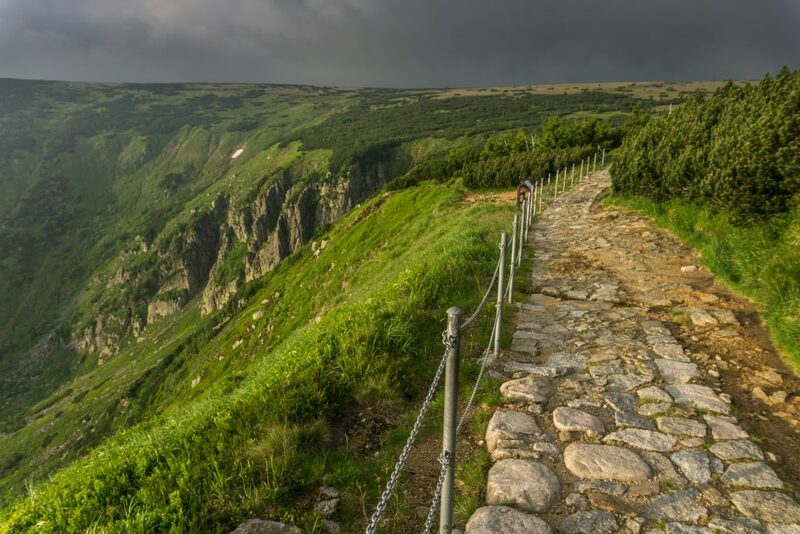 The trail continued in a steep hill towards Vysoké kolo (1509m). This was my favourite part of the trail. The landscape was very open now with tundra on the left side and deep gorge on the right. Clouds, hunting themselves on the sky, gave me such nice shivers that all of my confusion was chased away immediately. Oh mountains, my mountains! I love them. 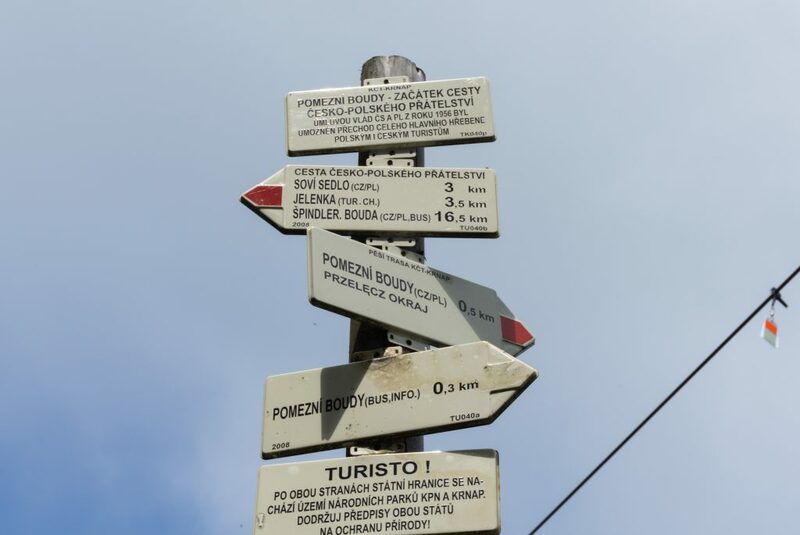 It was just a few more kilometres to Szrenica where the trail officially finishes. 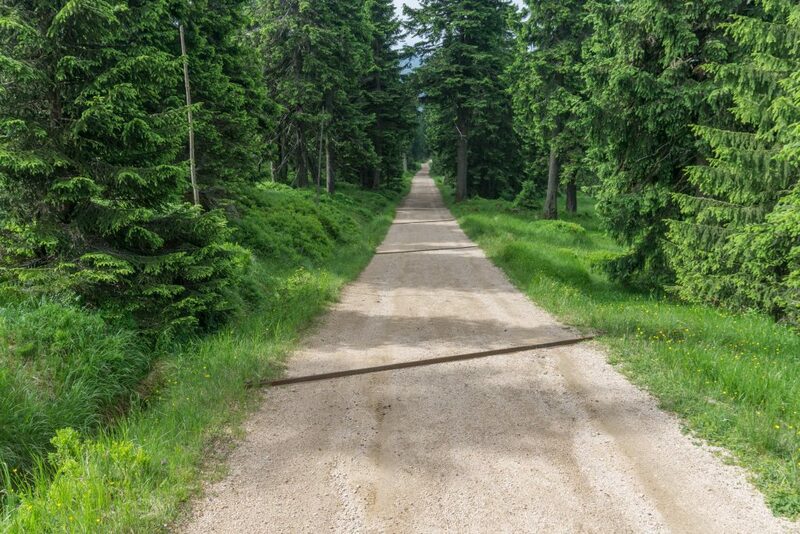 After that I began the descent into Harrachov which most of the time followed an asphalt road. 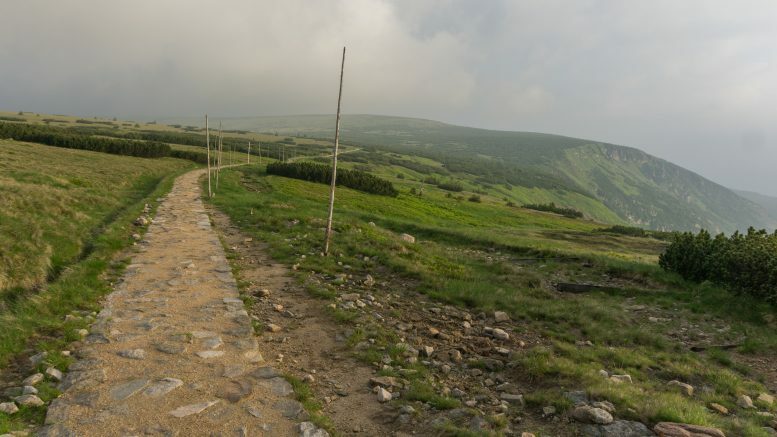 The whole track is about 30 kilometres long and it’s doable in one day but including the time for getting off and on the trail, I think 2 days are just enough for an average hiker. You can easily overnight in one of the many mountain huts on the way. Even though the trail is very far from what you can called “wild”, it’s still worth visit. Most of the time I walked on wide nicely paved routes and thanks to number of services along the way I think it’s great for people with kids. The trail could get really crowded so if you wanna enjoy at least a bit of solitude, go there during the weekdays and hit the trail as soon as there is light! 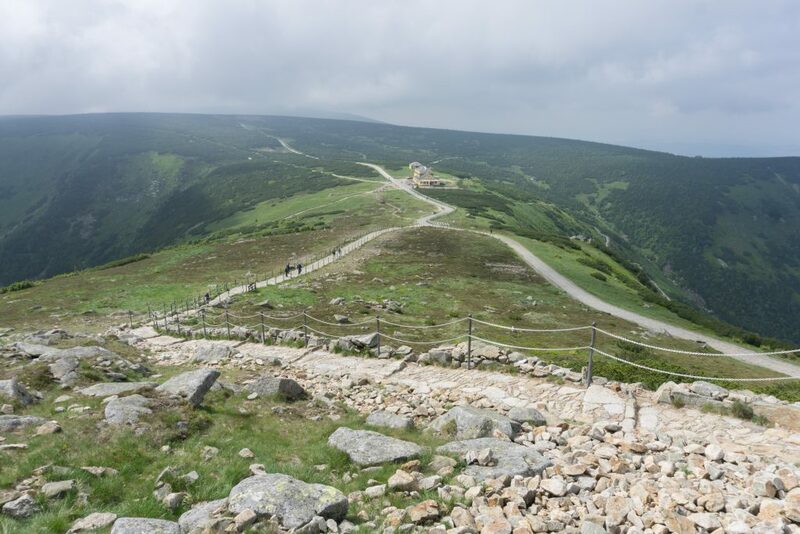 7 Comments on "The Polish–Czech Friendship Trail Hike Report"
How beautiful! I am told this is where my Grandfather was born. Thank you 🙂 Where exactly was your grandfather born? Hi Michal! Each family member has said something different. One says the Carpathians. One says Austria. One says Ruthenia. Each says something different. He was born in May of 1892, died August 1985 at 93 years of age. One family member had said since they kept changing the borders and names of the cities that was the reason for the discrepancies. Jé, tak to vám moc přeju! Dej kdyžtak vědět – třeba to zrovna nějak vyjde. Ráda bych vás poznala 🙂 Pozdravuj mi Island! Když nad tím tak přemýšlím, tak možná příští víkend. Napíšu mejla!